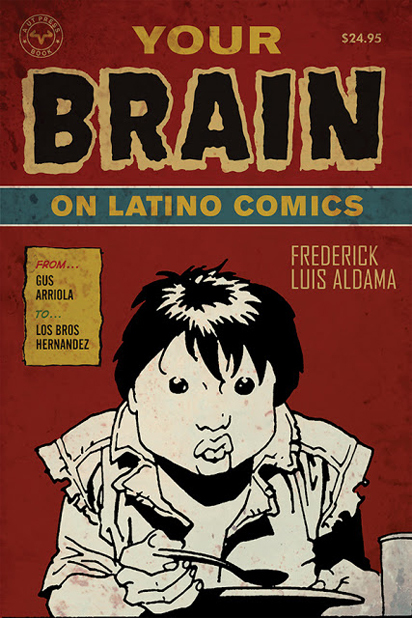 On a random search for latino comicbook characters, I came across this resource guide on latino comics, characters and creators titled Your Brain on Latino Comics: From Gus Arriola to Los Bros Hernandez by Frederick Luis Aldama. From its own description: “Aldama examines the ways in which Latino author-artists contributed to the reemergence of the comic-book industry following the restrictive 1950s, when it was rare for Latinos to be represented by anyone other than a heavily accented caricature. Latino comic-book auteurs, many of whom started their careers in the alternative and underground comics of the 1980s, have developed psychologically complex characters who have smashed Latino and other stereotypes, “radically extended[ing] the alternative-comic-book storytelling mode in various ways while they detail the everyday firmly located within a larger society.” Along with essays on history, there are looks at various latino characters as well as interviews with noted comic book creators such as Gus Arriola, the Hernandez Brothers, Frank Espinosa and more. I look forward to reading this and it has sparked ideas for future posts that hopefully will help to continue the topic. There’s also another book by Aldama that I’ll pick up at a later date titled Multicultural Comics: From Zap to Blue Beetle. Below are links to check out. ← Kiss Me, I’m Green! Interesting that I should pop into the site today, read this post, and then go over to tumblr and find the DC in the 80s tumblr has posted a nice piece on El Diablo, which I think I need to seek out now, after reading about it.